Unwanted household materials that are flammable, an oxidizer, corrosive, toxic, reactive, or contain polychlorinated biphenyls (PCBs) are considered hazardous waste. 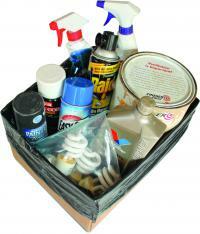 These common products can harm human health and the environment if used, stored or disposed of improperly. If a container has the words: POISON, DANGER, WARNING or CAUTION on the label and still has product left over it cannot go in the trash. Ramsey County collects and manages hazardous waste at a year round collection site and seasonal collection events throughout the year. Please note: Electronics are not accepted. Visit the Electronics page for disposal options. Tuesday - Friday: 11 a.m. - 6 p.m.
Safely dispose of unwanted, expired and unused medicines for FREE at one of Ramsey County’s two public drop boxes. Storing unwanted, expired and unused medicines can lead to drug abuse or poisoning, and medicines flushed down the drain or disposed of in the trash can harm the environment. Ramsey County is now accepting needles, syringes and lancets at both their mobile and year-round household hazardous waste collection sites. Check their website for more information. 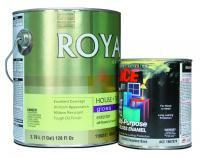 Numerous hardware stores throughout the state accept leftover cans of latex and oil paint from households and painting contractors. 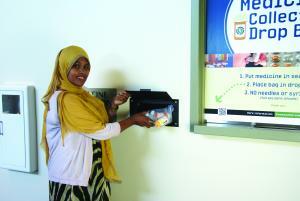 To find a store near you, check this paint drop-off site locator.